Hyload is a Wadsworth-based company providing roofing, waterproofing and masonry flashing products to the construction industry. Made in Medina County was able to sit down with Dave Afanador, Business Development Manager, to find out about Hyload. Could you please share a little about Hyload’s history? 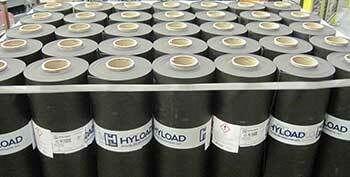 Hyload Inc. is a U.S. company with corporate offices in Seville and our manufacturing in Wadsworth. We began producing high-performance Dupont™ Elvaloy® thermoplastic membranes for low-slope roofing in the U.S. in 1982. We are part of IKO, a family business operating for more than 60 years providing global manufacturing and supply of quality roofing products including shingles, commercial roofing and asphaltic bituminous waterproofing products. Since its inception in 1982, Hyload has expanded beyond low-slope roofing membranes into waterproofing and masonry through-wall flashing membrane production. How are those product lines related? I think of it in terms of defending a structure against the elements. If you consider weather hitting your building, your first line of defense is the roof. You have to keep the water out from the top down. But next is the foundation – if your foundation is sound and fully water-proofed, you prevent damage and leaks just like from a solid roof. The third area is specifically related to brick buildings. When you build a building out of brick, the material naturally emits moisture which has to be managed or it can damage the structure. We create the material that channels the water away from the structure and out of the building properly. We’ve been building structures for as long as civilization has been around. What kinds of new products or initiatives are there in roofing and waterproofing? Actually, there are many! While we have had people building for a long time, recently we have had a surge in ways to help building owners cut down on maintenance, heating and cooling costs, and water management. One major innovation we’re excited about is a “green” roof. Green roofs use the flat surface to grow plants. New York City, Chicago, and Denver all have regulations requiring green roofing because if you think about what happens in a city during a heavy rain, sewer systems have to be able to manage the incoming water. Cities have found that green roofs actually capture some of that water and reduce the load on the waste water systems. The plants also filter the water to some degree so the water coming off the buildings is at a slower rate and is cleaner. Washington DC also has rebates in place for green roofs.Another innovation are white roofs. In southern climates with the sun beating down on a roof all day every day, a black roof can absorb a great deal of heat. We are now using white roofing products in those areas to combat that problem. It isn’t as useful in areas that get cold because during the winter if the sun is out, it can be helpful to absorb that heat so the building stays warmer. Finally, we have a roofing product that includes a type of rock that gives the roof strength against hail. It doesn’t come off the roof and deflects the material well without damage. 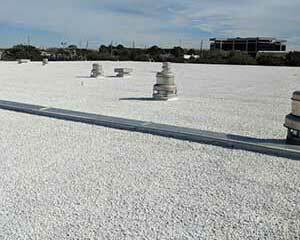 One example of our roofing products was in Houston. We have miles and miles of roofing installed in Houston and we finished one project two weeks before hurricane Harvey. All of the roofs there were subjected to 50 inches of rain in a short period of time and not one of ours leaked. That is a great story! So how do you approach product development? We are always looking for ways to make our products better. We watched regulations coming down from larger cities to challenges our contractors are facing in doing repairs. We also get calls directly from customers who will share a problem and we go to work to solve it. Our parent company also provides us with the resources of a global company. We can stay focused on our core competencies while they go out and research what’s coming. IKO is a global company so you are exposed to lots of areas around the country. Why Medina County? I personally have worked in a number of areas around the country and by far, Medina County is the most connected group of people I have ever encountered. Companies here are very in tune with their communities and it definitely changes the game. We all know one of the big challenges is workforce. How have you dealt with the workforce challenges? We are very lucky to have our sister company just down the road in Seville. Recently we had a big uptick in business on the Blair Rubber side and we were able to share teams to get the work done. That has opened a number of synergies between the two companies. It sounds like Hyload is seeing a lot of success. To what do you attribute that success? Hyload has always had really strong products that should be a big player in the roofing market. But the reality is no one knew we were here. We’ve put a lot of effort into marketing including a new website, new materials, we provide everything electronically, and shared the quality of our products, processes and people and it has made a real impact on our business. We’re now the company people at corporate want to study! 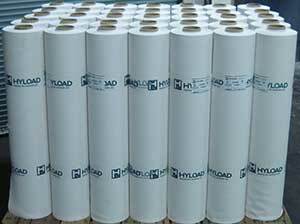 For more information on Hyload, visit the company’s website at www.hyload.com.